The HiQP Series of high input voltage DC-DC Modules feature superior functionality and characteristics that make them suitable for high end applications. Units in the HiQP Series provide wide input voltage range (125 to 475 Vdc) while maintaining tight output regulation along with low ripple and noise. HiQP Series has a full range of designed-in protections: Overtemperature, Input Overvoltage, Output Overvoltage, and Output Current Limit. HiQP Modules also feature: Remote Shutdown, Trim capability, Onboard Reference Voltage, and, for increased reliability, do not use OptoCouplers in the feed-back look. Load Share function provides a simple way for parallel operation, allowing for increased power with "N+1" redundancy. 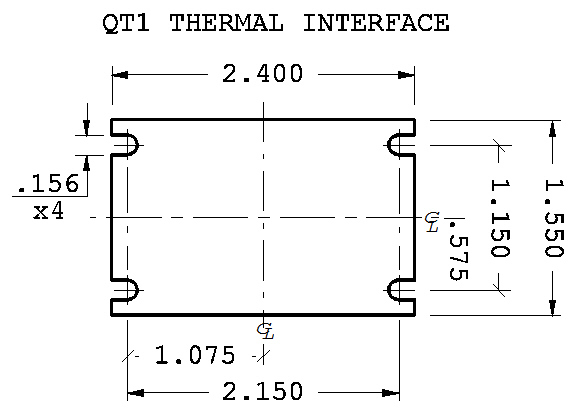 All modules in HiQP Series are fitted with Input LC Filters to reduce reflected current ripple. Additionally, the Soft -Start function eliminates input inrush current and output voltage overshoot during start-up. HiQP Series units are fully encapsulated for ruggedized operation. 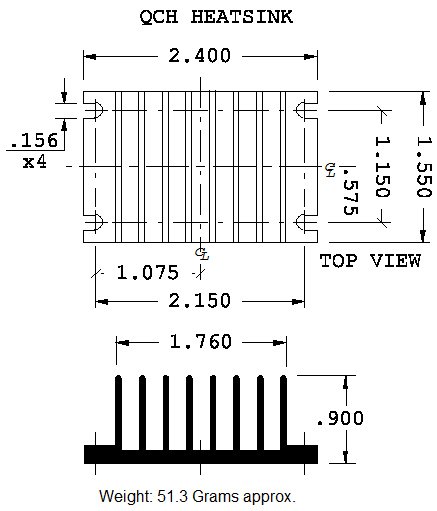 Case Dimensions: LxWxH is 2.5" x 1.55" x 0.5"
Output Voltage: 24Vdc to 200Vdc. 5 standard voltages. Custom output voltages are also available. 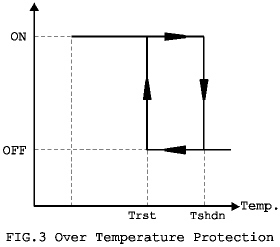 0°C to +70°C Standard Operating Temperature. 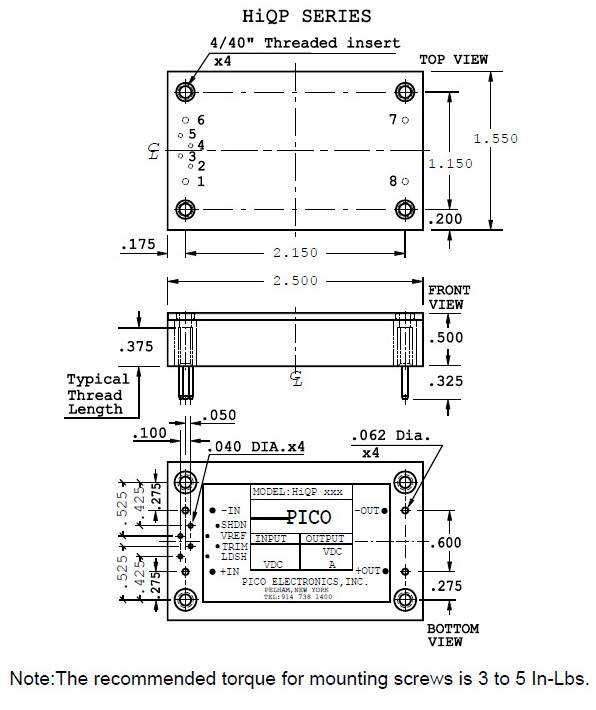 Call 800-431-1064 to speak with an engineer for any additional requirements. ***2.5W minimum load required in order to prevent output to overshoot more than 2% Vout, nominal. 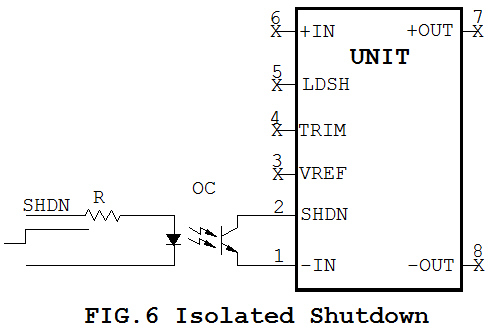 Remote Shutdown is enabled when Pin # 2 (SHDN) is pulled LOW (to Pin # 1) within less than 0.4V. Shut-Down Pini released of floating will allow for converter operation. The Shut-Down function can be used in applications requiring On/Off control. This may be done in different was: Non-isolated control could be implemented by using a bipolar transistor, Mosfet, or a switch. Isolated operation would require a relay or an opto-coupler. Modules in HiQP Series have a designed-in circuit allowing for parallel operation of multiple converters. This function is enabled by connecting LDSH pins (Pin #5) of units to operate in parallel. The connection ensures active sharing of the load by paralleled converters. Beside increase power, Load Share function allows for true "N+1" redundancy. Pin # 1 (-IN): Negative Input Voltage to the unit - 125-475Vdc. Units are Input OV protected, non-latched shut-down. 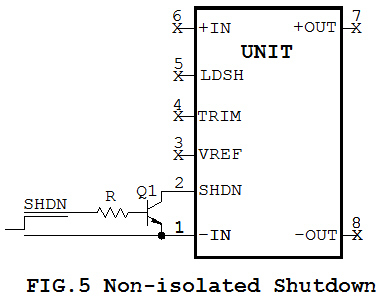 Pin # 2 (SHDN): When pulled below 0.4Vdc will cause the unit to shut down, non-latching. Leave unconnected if not used. Pin # 3 (VREF): 3 Vref generated on board. 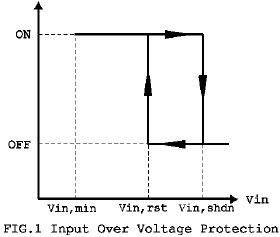 Reference voltage tolerance: +/- 2%. Current sourcing capability: 10mA max. Pin # 4 (TRIM): Connecting this pin through a resistor to -IN will increase Vout. Connecting it through a resistor to VREF will reduce Vout. Minimum adjusting range is: +/-10% of Vout nominal. 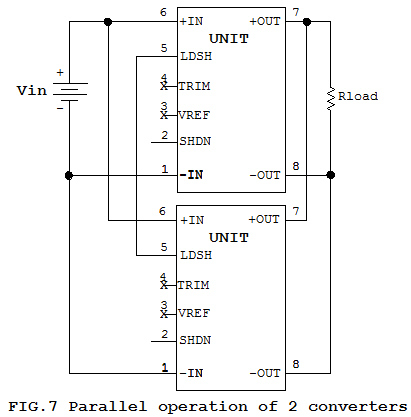 Pin # 5 (LDSH): By connecting together this pin on multiple paralleled modules, sourcing current in same load, it is ensured that output currents will be equally balanced. Useful for increased power and "N+1" redundant power systems. Pin # 6 (+IN): Positive Input voltage to the unit. Pin # 7 (+Out): Positive Output voltage. 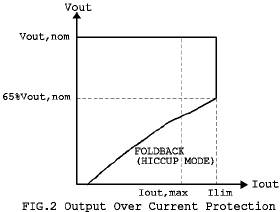 A minimum 10% load across the output is required in order to provide regulation. The output is clamped with Zener diodes at a 120% Vout (typical) to limit overshoot in case of no-load operation. Pin # 8 (-OUT): Negative Output voltage.